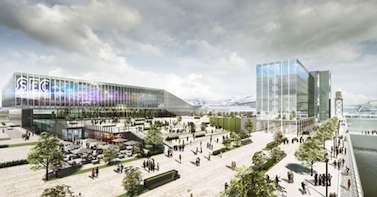 The project includes a dedicated entrance to the west of the campus and additional multi-purpose meeting and circulation spaces with panoramic views of the city and River Clyde. It is estimated that “in a mature year” the new facilities would generate £123 million of economic benefit to the Glasgow area, £106 million to Scotland and £71 million to the UK. This would be in addition to the £400 million of impact for Glasgow, £227 million for Scotland and £136 million for the UK generated annually from the existing facilities. It is estimated that economic payback for the tax payer would be within five to seven years. SEC finance & development director Billy McFadyen said: “The SEC currently offers Glasgow and Scotland a solution to stage conferences of varying sizes. “However, competition worldwide is robust and constantly evolving. “In order to maintain this level of success we need to invest in our product to ensure we have the best facilities. “The plans for this expansion will fulfil this and create a truly unique UK Event Campus which will be world class. “During the past two decades, Glasgow and the SEC have succeeded in the conference market and strong, city-wide partnerships have been instrumental in securing business. “It is widely recognised that events drive immediate economic benefit of scale for cities and countries. “Conferences and Exhibitions in particular, provide a catalyst for further long-term economic benefit. “The focus now is to secure funding support for the project which will be of significant benefit to Glasgow, Scotland and the UK’s economy”.